Originally a palette swap of Scorpion, Reptile's design evolved as the series progressed. Included in the first game late in the development process, Reptile's character concept was conceived while Boon was driving back to work from lunch. Noting the success of utilizing a palette swap method for Scorpion and Sub-Zero's character sprites, he and Tobias decided to include a "super secret hidden feature" in Mortal Kombat, choosing Reptile's green color as a contrast to Scorpion's original yellow and Sub-Zero's blue colors. Developed with the premise of being "a cooler version of Scorpion", the character's concept was completed in a single evening. Reptile's inclusion was intended as a marketing tool for the arcade game: as extreme conditions must be met to encounter Reptile, the designers hoped to rely on word of mouth to spread rumors of the character's existence. However, the character was not included in the title until version 3.0 of the game. Reptile's appearance caused fans to speculate that he could be unlocked and used as a controllable character. Boon noted in a later interview that due to the popularity of the rumors surrounding the character, they decided to include Reptile in subsequent installments of the series as a playable fighter. Reptile was originally depicted as a tall, muscular, light-skinned humanoid. Due to his origin as a palette swap of Scorpion and Sub-Zero, his attire was identical to theirs only colored in green. His clothing consists of pants and boots covering his lower body, along with a black sleeveless shirt and open hood. Green light armor covered his forearms and lower legs, while an open V-shaped green vest protected his torso, extending to a matching small fauld and loincloth. He wears a green facial mask as part of his ninja disguise to conceal his true reptilian nature, however he does remove the mask in-game for his acid spit attack (which was Daniel Pesina's idea inspired by an episode of The Amazing Spider-Man) or his tongue grab Fatality. Reptile stands 6 feet (183 cm) tall, and speaks in a hissing tone. In Mortal Kombat 4, Reptile's appearance became more reptilian, with his head completely uncovered. His hands became clawed, while his feet were now three-toed talons. By Deadly Alliance, Reptile had developed a full reptilian head and tail, with gold and black armor to cover his legs, elbows, shoulders, and belt, and he was competely barefoot. Bone spurs extended from the base of his skull down his spine, ending at the tip of his tail, while a similar spur extended from his heel on each bare foot. Ed Boon described the changes to Reptile's design over the course of the two games as hinting at him "evolving into a bigger character", and foreshadowing Onaga controlling his body in Deception. Reptile's appearance in Shaolin Monks used an amalgam of his three previous designs, intended by character designer Mark Lappin to portray a classic yet fresh feel for the character. The design incorporated the appearance of his body from Mortal Kombat 4, his clothing from the original Mortal Kombat, and the look of his bare feet, hands, and armor from Deadly Alliance. In addition, black strips of cloth wrapped around his forearms, hands, and head, leaving his eyes, mouth and bare feet exposed. The design was later reused as his primary outfit in Armageddon, with his appearance from Deadly Alliance serving as his secondary outfit. As a secret character in the first Mortal Kombat, Reptile features a hybrid of Sub-Zero's and Scorpion's attacks, such as the former's freezing projectile and the latter's harpoon. When made a playable character for later installments, his moves were changed completely. His Forceball attack creates an energy ball from his hands, while his Acid Spit attack produces a higher, faster projectile. Reptile can slide towards the opponent, or turn invisible for a brief period of time or until hit. Later titles in the series modify these moves, such as splitting the Forceball attack into slow and fast variants, or remove moves in favor of different attacks, only to return them in the next installment. Reptile's Fatalities in Mortal Kombat II consist of revealing his reptilian face in order to devour the opponent's head, or turning invisible and severing the opponent's torso. Later finishing moves expand upon the concept, ranging from regurgitating acid upon the opponent to leaping upon their body and gnawing the flesh from their skulls. In a series retrospective, the Mortal Kombat development team named Reptile's finishers as some of their favorites from the series. In the original Mortal Kombat, Reptile is a mysterious hidden enemy character, unplayable and with no biography. Hints regarding the conditions of how to unlock the fight against him are conveyed by Reptile randomly appearing prior to other matches. Some of these hints include "Look to La Luna," "Perfection is the key," and "Alone is how to find me." To fight Reptile, the player must get a Double Flawless victory in single player mode on the Pit stage and finish the match off with a Fatality, all without blocking. There must also be a silhouette flying past the moon, which will occur every sixth game. In Mortal Kombat II, Reptile returns as a playable character and a member of a reptilian race called Raptors, who were pulled into Outworld and enslaved by Shao Kahn. Promised the revival of his people in turn for his loyalty, Reptile serves Kahn as Shang Tsung's bodyguard. He was chosen to assist Jade in order to kill Kitana during the events of Ultimate Mortal Kombat 3, he is defeated and exiled, but reappears in Mortal Kombat 4 as Shinnok's minion. By Mortal Kombat: Deadly Alliance, Reptile returns to Kahn's service. He overhears Shang Tsung plotting to kill Kahn, but en route to warn his master, he meets a female vampire who offers knowledge of his race. Reptile pledges his loyalties to her, though eventually realizes she is merely using him and sets out to kill her. Instead of the vampire he finds Onaga's dragon egg instead, which transforms Reptile into Onaga's avatar, leading to the events of Mortal Kombat: Deception and ending with his defeat at the game's conclusion. Separated from Onaga as a result, Reptile returns in Mortal Kombat: Armageddon. In Konquest mode in Armageddon, he appears in the Red Dragon lair commanding Daegon's dragon Caro to close the portal but refused. Taven battles Reptile in combat and emerges victorious. 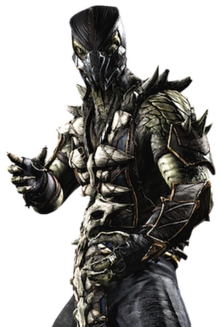 Reptile also appears in Mortal Kombat: Shaolin Monks, appearing in the game's opening sequence and later as a boss. During development, producer Shaun Himmerick noted that Reptile was included in the game because the character was one of Himmerick's favorite in the series. Originally included in NBA Jam Tournament Edition alongside other Mortal Kombat characters as an unlockable player, he was eventually removed from later versions of the game at the request of the NBA. Reptile reappears in the 2011 Mortal Kombat video game. His character as now actual dialogue, mostly speaking through hisses and grunts. Reptile fights for Outworld against Earthrealm in the tenth Mortal Kombat tournament. He battles Johnny Cage during the first match of the tournament, but is defeated. After the end of the tournament, Reptile, Baraka, and Kitana bring Shang Tsung to Shao Kahn, the Emperor of Outworld, to stand trial for his failure to merge the realms. Reptile makes another appearance during the second Mortal Kombat tournament, whispering to Shang Tsung something inaudible, which pleases the sorcerer. Reptile is next seen in the Living Forest. While Kano and Shang Tsung prepare to make a deal over the Black Dragon firearms, Smoke interrupts. After Smoke defeats Kano, Shang Tsung morphs into the elder Sub-Zero and teams up with Reptile to face Smoke in a two-on-one fight. Smoke defeats both Reptile and Shang Tsung. When the younger Sub-Zero demands to face Scorpion, he is instead forced into a duel with Reptile, and emerges victorious against the reptilian ninja. Reptile then appears during the Earthrealm invasion, scaling a building which police officers Kurtis Stryker and Kabal are on top of. Reptile dodges all of the bullets fired at him, and spits acid at Kabal, incapacitating him. Stryker then battles Reptile and defeats him. After losing to Stryker, he is not seen again. Reptile appears as a minor character in several of Malibu Comics' Mortal Kombat comic book series released in 1995, debuting in the Goro: Prince of Pain miniseries as a member of a team led by Kitana to find the missing Goro, later appearing in the Battlewave miniseries hypnotizing Sonya Blade into wanting to marry Shao Kahn, and in several one-shots, such as Kitana and Mileena. He also appears in comics published by Midway for Mortal Kombat II and Mortal Kombat 4, based on his role in each title. In the comics, Reptile speaks in the same hissing tone as he does in the games. A paperback novel written by C. Dean Anderson entitled Mortal Kombat: Reptile's World was released in 1996. Written for junior readers, the book described the past of Reptile's fictional race through the eyes of other series characters. Reptile later appears in the 1995 film Mortal Kombat as a bipedal lizard, camouflaging himself until found by Liu Kang. After being thrown into a statue, Reptile transforms into a human-looking ninja and battles Liu Kang, but is defeated and then crushed after reverting to his original form. Reptile's lizard form was rendered with the use of computer-generated imagery, while the character's human form is portrayed by Keith Cooke, clothed similar to Scorpion and Sub-Zero in the film, but green and with a fanged open mouth imprinted on his face mask. Originally not included in the movie, Reptile was added in response to focus groups being unimpressed with the original fights in the film. Actor Robin Shou (Liu Kang) and director Paul Anderson noted that neither knew what Reptile's lizard form would look like until after filming, making the pre-fight sequence difficult to shoot. The 1998 television series Mortal Kombat: Konquest features Reptile in his human form, portrayed by Jon Valera. Commander of Shao Kahn's Raptors, he betrays Kahn and forms an alliance with Kreeya to share dominion over Kahn's domain and serve as one of her mates, only to be killed later during an ambush by Shao Kahn's priests. A similar character named Komodai appears in the animated Mortal Kombat series' third episode, leading an attack with other Raptors. Voiced by Josh Blyden, he is defeated and sent back to Outworld. Reptile featured in director Kevin Tancharoen's 2010 short film Mortal Kombat: Rebirth, a grittier, more realistic take on the MK canon. He was played by Richard Dorton and depicted therein as a cannibalistic criminal who eats his victims' heads after killing them. While not an inhuman ninja, the character suffers from a real-life disease known as Harlequin-type ichthyosis, giving him patchy scale-like skin and eyes that are grown inward. 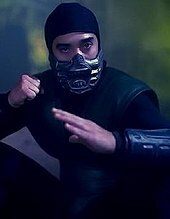 Reptile was the only character from the film who did not carry over into Tancharoen's Mortal Kombat: Legacy web series. Skrillex released the single "Reptile's Theme", referring to the Mortal Kombat character and sampling from the game, in a compilation album titled Mortal Kombat: Songs Inspired by the Warriors. A Reptile action figure was released by Hasbro as part of a G.I. Joe line of toys, packaged with the series-themed vehicle for the toyline. The figure comes with a katana and grappling hook. Another action figure to promote Shaolin Monks was released in 2006 by Jazwares. Fully posable, it includes an alternate head, detachable tongue and a large-bladed scimitar. He was one of many MK characters depicted on 2.5" x 3.5" collectible magnets released by Ata-Boy Wholesale in 2011. Reptile also featured prominently in the introduction sequence of Mortal Kombat 4, portions of which were used in a television commercial to promote the game. The character has been well received by critics. GameSpot said that Reptile gives the series "an air of mystery" due to the circumstances behind his first appearance, while CraveOnline listed the battle against him in Mortal Kombat as the fourth greatest event in video gaming. He was fifth in Game Revolution's list of top "old school" Mortal Kombat characters", praised for his introduction in Mortal Kombat and his changes in the sequel. IGN listed him as a character they would like to see as downloadable content for Mortal Kombat vs. DC Universe, noting "It's just not [a Mortal Kombat] game without a bevy of palette-swapped ninjas...and our vote goes to Reptile." He was featured in a 2008 MSN article about the ten greatest Easter eggs in gaming. In 2010 UGO, included him on the list of the 25 coolest hidden characters in video gaming. In UGO Networks' 2012 list of the top Mortal Kombat characters, Reptile placed sixth, stating that he is the best hidden character in the series. ^ "Mortal Kombat Characters & Concept Artwork". CreativeUncut.com. Retrieved November 20, 2013. ^ Surette, Tim (2006-03-10). "Mortal Kombat Actors Get Work". GameStop. Archived from the original on 2012-07-31. Retrieved 2008-12-25. ^ a b c d Midway (2006-10-11). Mortal Kombat: Armageddon. Midway. Level/area: Reptile Kombat Card video. ^ Brian Chard [@bcharred] (April 14, 2015). "Huge thanks to the stellar MKX voice actors: Troy @TroyBakerVA (Shinnok/EBlack/Fujin), Ronald M. Banks (Quan Chi); Ashly Burch (Cassie)..." (Tweet). Retrieved June 2, 2018 – via Twitter. Brian Chard [@bcharred] (April 14, 2015). "... Steve Blum (SubZero/Reptile/Bo'RaiCho); Johnny Yong Bosch (Kung Jin); Andrew @AndrewSBowen (Johnny/Smoke/Rain); Greg Eagles (Jax/Baraka)" (Tweet). Retrieved April 15, 2015 – via Twitter. ^ a b Kent, Steve L. (2000). The First Quarter: A 25-year History of Video Games. BWD Press. p. 370. ISBN 0-9704755-0-0. ^ a b Greeson, Jeff & O'Neill, Cliff. "The History of Mortal Kombat - Mortal Kombat (1992)". GameSpot. Archived from the original on 2007-10-21. Retrieved 2008-12-25. ^ Midway (1995). Mortal Kombat 3. Midway. Level/area: Ed Boon and John Tobias interview. ^ "An Oral History of 'Mortal Kombat'". MEL Magazine. 2018-11-26. Retrieved 2018-12-25. ^ a b c Wartow, Ronald (1996). Official Ultimate Mortal Kombat 3 Fighter's Kompanion. BradyGames. p. 370. ISBN 1-56686-639-1. ^ a b c Midway (2002-11-20). Mortal Kombat: Deadly Alliance. Midway. Level/area: Reptile biography card. ^ a b Midway (1997-10-15). Mortal Kombat 4. Midway. Level/area: Reptile ending. ^ a b Midway (2006-10-11). Mortal Kombat: Armageddon. Midway. Level/area: Onaga Kombat Card video. ^ a b Himmerick, Shaun. "Developer Diary#3: Characters". Mortal Kombat Online. Retrieved 2008-12-26. ^ "Mortal Kombat: Shaolin Monks Media". Game Informer. Archived from the original on 2006-05-28. Retrieved 2008-12-26. ^ Publications International, Ltd (1993). Mortal Kombat Action Strategies: An Authorized Player's Guide. New Amer Library. ISBN 0-451-82290-0. ^ a b Taylor, Matt; Fink, Jim (1995). Mortal Kombat II: Official Player's Guide. Infotainment. ISBN 1-57280-028-3. ^ a b Arnold, Douglas (1998). Mortal Kombat 4 Survival Guide: Players Guide. Semantix Design Llc. ISBN 1-884364-44-6. ^ Midway (2006-10-11). Mortal Kombat: Armageddon Premium Edition. Midway. Level/area: "The History of Fatalities" commentary. ^ Carter, Chip; Jonathan, Carter (1994-02-07). "They are just dying to talk about Mortal Kombat". St. Petersburg Times. p. 5D. ^ Midway (2007-07-15). Mortal Kombat: Armageddon. Wii. Midway. Level/area: Fighter of the Wiik: Khameleon. ^ Midway (1993). Mortal Kombat II. Midway. Level/area: Reptile ending. ^ Midway (1995). Ultimate Mortal Kombat 3. Midway. Level/area: Reptile ending. ^ Midway (2002-11-20). Mortal Kombat: Deadly Alliance. Midway. Level/area: Reptile ending. ^ "Shujinko bio". Midway Games. Archived from the original on October 17, 2007. Retrieved November 16, 2009. ^ Vore, Bryan (2005-09-19). "Mortal Kombat: Shaolin Monks Hands-On Impressions". Game Informer. Archived from the original on 2005-11-07. Retrieved 2008-12-26. ^ Staff (1995). NBA JAM Tournament Edition Player's Guide. BradyGames. ISBN 1-56686-232-9. ^ a b Marshall, Charles (1996). Mortal Kombat: Battlewave. Norma Editorial. ISBN 84-7904-360-1. ^ Anderson, C. Dean (1996). Mortal Kombat: Reptile's World. Berkley Books. ISBN 1-57297-131-2. ^ Goldman, Michael & Aaron, Richard E. (1995). Mortal Kombat: The Movie Behind the Scenes. Prima Games. ISBN 0-7615-0082-0. ^ Reed, Dr. Craig D. (1998-01-01). "Mortal Kombat: Annihilation - Behind the Scenes at the New Hollywood Blockbuster". Black Belt. Active Interest Media, Inc. 36 (1): 85. ISSN 0277-3066. ^ Young, Becky (2010-06-09). "Exclusive Interview with Mortal Kombat Actor". CraveOnline. Retrieved 2010-06-10. ^ Santelmo, Vincent (2001). The Complete Encyclopedia to GI Joe. Krause Publications. p. 509. ISBN 0-87341-874-3. ^ "Mortal Kombat Shaolin Monks Series 3 Action Figure Reptile". ToyWiz. Archived from the original on 2006-08-19. Retrieved 2008-12-26. ^ Reptile 2.5" x 3.5" magnet - Ata-Boy Wholesale, 2011. Retrieved February 26, 2014. ^ Midway (1997-10-15). Mortal Kombat 4. Midway. Level/area: Opening sequence. ^ Azevedo, Jeremy (2008-01-13). "Top 10 Most Pants-Crappingly Awesome Video Game Secrets". Craveonline. Archived from the original on 2008-02-02. Retrieved 2008-12-25. ^ Jensen, K. Thor; Severino, Anthony (2011-02-03). "Top 10 Old School Mortal Kombat Characters". Game Revolution. Retrieved 2011-05-23. ^ Schedeen, Jesse (2008-09-12). "DLC Player Wanted MK vs. DC". IGN. Retrieved 2008-12-24. ^ Taylor, Nik. "10 greatest gaming Easter eggs". MSN. Archived from the original on 2008-03-27. Retrieved 2009-11-05. ^ "The 25 Awesomest Hidden Characters". UGO.com. Archived from the original on 2010-12-09. Retrieved 2010-12-07. ^ UGO Team (2012-02-28). "Top 50 Mortal Kombat Characters - Mortal Kombat". UGO.com. Archived from the original on 2012-09-29. Retrieved 2012-03-15. This page was last edited on 4 March 2019, at 02:30 (UTC).